New to Boots this week is Benefit Sun Beam, a golden bronze highlighter designed to give that ‘just off the jet’ look all year round. Making a nice, seasonal addition to the Beam collection, Sun Beam is a subtle antique gold shade which shines beautifully in the light for a naturally glowing complexion. As we all know, make-up is as much about the packaging as it is about the contents, and Benefit never fails on that account. 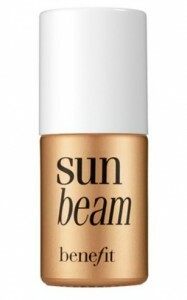 Sun Beam comes in a nail-varnish style bottle encased in golden boxing. A small amount of liquid can be dabbed onto the cheekbones and blended using the finger tips to highlight the ridge of the bone, emphasising facial structure. Injecting subtle colour and shine to the skin can very subtly lift the face, making it look youthful and enlivened. Benefit Sun Beam promises to take you through the British summertime so you can look gleaming and sun-kissed even in the rain. Grab your bottle today at Boots for £18.50.